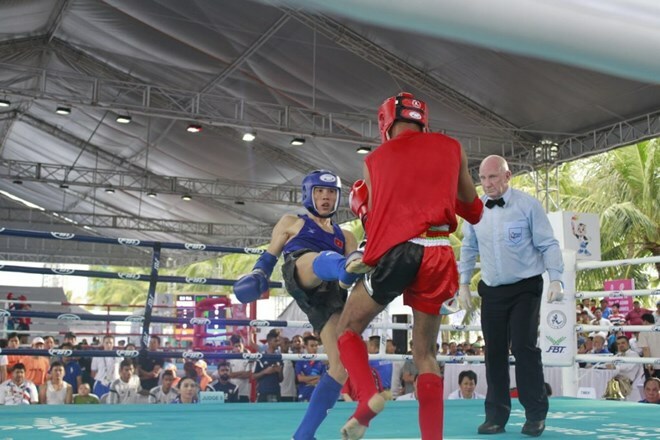 Da Nang (VNA) - Vietnamese Nguyen Ke Nhon and his teammates bagged three bronze medals for Vietnam in Muay Thai on September 23 in the fifth Asian Beach Games in Da Nang. They are the first medals for Vietnam in the games, the opening ceremony of which will be held on September 24. Nhon, who lost to Sayassatov Yelaman from Kazakhstan in the men’s Flyweight (48-51kg) semi-final, was awarded the bronze medal. His teammate Le Hoang Duc, who compete in the men’s Light Flyweight (45-48kg) category, also bagged a bronze medal after a loss to Thailand’s PinthongPhitsanu in the semi-final. Tran Thi Truc took bronze in the women’s Bantamweight (51-54kg). The three bronze medals took Vietnam to fourth in the medal table after Thailand, Kazakhstan and China. In other matches on September 23, Bui Yen Ly of Vietnam booked a spot in the final of the women’s flyweight (48-51kg) after beating Pan Ting Wai of Chinese Taipei in the semi-final.